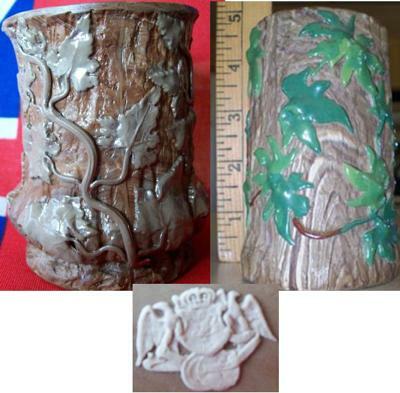 Elaborate Pot Mark on Tree Trunk & Ivy Vase:- Bought this small pottery tree trunk with ivy vase for .30. It seems to be made of brown clay by hand with matte gray and brown molding to appear like bark graining and shiny green glaze ivy leaves and brown vine. I keep thinking that the pot isn't much but someone went to a lot of trouble with the stamp. I really can't see the mark very well. Both of you have the advantage of having the item in front of you, of course. Without that information, I can't make a comment right at the moment, but will think about this query and come back with a further comment later. Please read my added comments above. Many thanks for the additional pics. I have added these to the original post. I feel these items are really unusual - a very detailed cameo bas-relief pottery mark in the style of french pate-sur-pate or Jasperware. Normally this ornate sprigging is only found on outer decoration of high quality wares. Together with an ornate style of hand applied decoration bas-relief on the outside of the wares, make these items very unusual, particularly as the overall effect is very naive or primitive. Frankly, these items confuse me I have never seen their like, but I am sure an expert will know of these. I have a very similar vase too !! I too have a vase with the exact same backstamp and very similar decoration, although my tree trunk has a different leaved plant trailing up and down it. Mine is also a little smaller at approx 4 inches high. Anybody else have any more information to give on the maker of these items ?? Hello, I need help with identifying this mark please. I have exhausted all avenues I can think of on the web and my local antiques dealer has never seen anything like it. The vase is about 15 centimeters inches high and appears to be a clear glaze over brown clay which has incised striations. Over this is a high relief of ivy and trumpet shaped flowers in white winding around the vase. The rim is foliate shaped. The marks underneath are as follows - a very clear incised W and the numeral 7 on the outer edge of the foot and then a white mark in bas relief of two classical figures. These are not clear but seem to be women, one holding a sword or a cross the other holding something round. This is obviously an old piece - it is a family item amongst others inherited from various relatives. Most of the pieces date from 1880 or so and are well known brands such as Wedgwood, Doulton etc. Well actually a friend found it for me - he is excellent at hunting down these mysteries. The company is Boch Freres Keramis (i.e. Boch Brothers Ceramics) from Belgium. 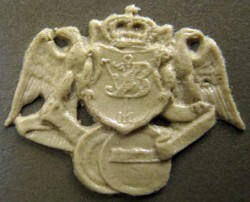 The mark on the base is a classical scene denoting that they won a gold medal at the Exhibition of products for the Belgian industry in 1847 . This mark is used until approx 1870 -1872. Boulevard des Droits de l'Homme 19, La Louvière, Belgium. "Marbled earthenware vase in the style of Api faience pottery with gadroon decoration and applied (sprigged) vine branches. 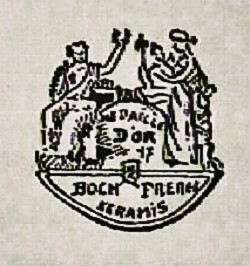 Marked "Boch Frères Kéramis" applied on a sprigged medallion depicting an ancient scene. Dated to mid 19th Century." Founded in 1844, the factory survived until 1985. There are links to Royal Boch. They are many beautiful designs from this factory, especially the work of the artist Catteau. The white applied design is called "sprigging". This mark is quite different from the other vases you have on the site – I believe theirs is Mettlach (see image below). WE HAVE THE ANSWER FOLKS! You have not only found the answer for you, you have solved the mystery of origin for us all. It was clear to me from researching the timeline of the company Villeroy and Boch that these two interlinked firms were making similar faience sprigged vases in two different places (Mettlach, Saar and Saint-Vaast, Hainaut) and putting on their own individual sprigged mould pottery marks. The date for both appear to be the mid-1800's and this is a very important and historic maker, so expect the values to be high for these items. 1748 - Francois Boch starts making ceramics in the Lorraine border region (from the Luxemburg loam). 1791 - Nicolas Villeroy founds a factory in Vaudrange on the river Saar. 1792 Pierre-Joseph Boch takes sole ownership of the Boch plant, as sole family survivor. 1806, Jean-François Boch (son of Pierre-Joseph) marries rich heiress Anne Marie Rosalie Buschman, thus gaining sufficient finance to buy old abbey in Mettlach in the Saar region. 1836 - A treaty eventually opens the way for the merging of the two Saar pottery concerns into a joint company called Villeroy & Boch. 1841 - Jean-François's son, Eugène Boch is tasked with founding a new Belgian branch at Saint-Vaast, Hainaut. This factory is named "Keramis"
1844 - The “BOCH Frères” company is formed between brothers Eugène and Victor together with their brother-in-law Jean-Baptiste Nothomb.